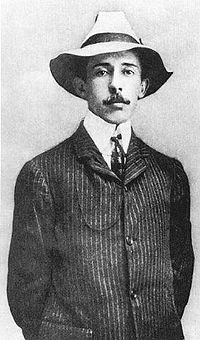 Alberto Santos-Dumont (July 20, 1873 - July 23, 1932) was a Brazilian early pioneer of aviation. Heir of a prosperous coffee producer family, Santos Dumont dedicated himself to science studies in Paris, France, where he spent most of his adult life. Santos-Dumont designed, built and flew the first practical dirigible balloons. In doing so he became the first person to demonstrate that routine, controlled flight was possible. 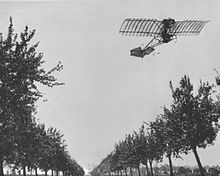 This "conquest of the air", in particular winning the Deutsch de la Meurthe prize on October 19, 1901 on a flight that rounded the Eiffel Tower, made him one of the most famous people in the world during the early 20th century. In addition to his pioneering work in airships, Santos-Dumont made the first European public flight of an airplane on October 23, 1906. 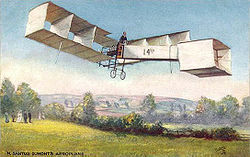 Designated 14-bis or Oiseau de proie (French for "bird of prey"), the flying machine was the first fixed-wing aircraft witnessed by the European press and French aviation authorities to take off and successfully fly. 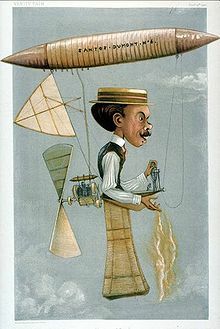 Santos-Dumont is considered the "Father of Aviation" in Brazil, his native country. His flight is the first to have been certified by the A�ro Club de France and the F�d�ration A�ronautique Internationale (FAI). Santos-Dumont also occupied the 38th chair of the Brazilian Academy of Letters, from 1931 until his death in 1932. Santos-Dumont was born in Cabangu Farm, a farm in the Brazilian town of Palmira, today named Santos Dumont in the state of Minas Gerais. He grew up as the sixth of eight children on a coffee plantation owned by his family in the state of Sx�o Paulo. His French-born father was an engineer, and made extensive use of the latest labor-saving inventions on his vast property. So successful were these innovations that Santos-Dumont's father gathered a large fortune and became known as the "Coffee King of Brazil." He was fascinated by machinery, and while still a young child he learned to drive the steam tractors and locomotive used on his family's plantation. He was also a fan of Jules Verne and had read all his books before his tenth birthday. He wrote in his autobiography that the dream of flying came to him while contemplating the magnificent skies of Brazil in the long, sunny afternoons at the plantation. According to the custom of wealthy families of the time, after receiving basic instruction at home with private instructors including his parents, young Alberto was sent out alone to larger cities to do his secondary studies. He studied for a while in "Col�gio Culto x� Cix�ncia", in Campinas. In 1891, Alberto's father had an accident while inspecting some machinery. He fell from his horse and became a paraplegic. He decided to sell the plantation and move to Europe with his wife and younger children. At 17, Santos-Dumont left the prestigious Escola de Minas in Ouro Preto, Minas Gerais, for Paris in France. Shortly after he arrived, he bought an automobile. Later, he pursued studies in physics, chemistry, mechanics, and electricity with the help of a private tutor. Santos-Dumont described himself as the first "sportsman of the air." He started flying by hiring an experienced balloon pilot and took his first balloon rides as a passenger. He quickly moved on to piloting balloons himself, and shortly thereafter to designing his own balloons. In 1898, Santos-Dumont flew his first balloon design, the Br�sil. After numerous balloon flights, he turned to the design of steerable balloons or dirigible type balloons that could be propelled through the air rather than drifting along with the breeze (See Airship). Between 1898 and 1905, he built and flew 11 dirigibles. With air traffic control restrictions still decades in the future, he would glide along Paris boulevards at rooftop level in one of his airships, commonly landing in front of a fashionable outdoor cafe for lunch. On one occasion he even flew an airship early one morning to his own apartment at No. 9, Rue Washington, just off Avenue des Champs-x�lys�es, not far from the Arc de Triomphe. 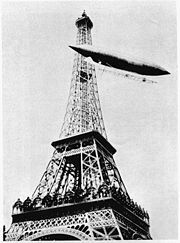 To win the Deutsch de la Meurthe prize Santos-Dumont decided to build a bigger balloon, the dirigible Number 5. On August 8, 1901 during one of his attempts, his dirigible lost hydrogen gas. It started to descend and was unable to clear the roof of the Trocadero Hotel. A large explosion was then heard. Santos-Dumont survived the explosion and was left hanging in a basket from the side of the hotel. With the help of the crowd he climbed to the roof without injury. The zenith of his lighter-than-air career came when he won the Deutsch de la Meurthe prize. The challenge called for flying from the Parc Saint Cloud to the Eiffel Tower and back in less than thirty minutes. The winner of the prize needed to maintain an average ground speed of at least 22 km/h (14 mph) to cover the round trip distance of 11 km (6.8 miles) in the allotted time. Picture - Aida D'Acosta Breckinridge piloted Santos-Dumont's airship in 1903. On October 19, 1901, after several attempts, Santos-Dumont succeeded in using his dirigible Number 6. Immediately after the flight, a controversy broke out around a last minute rule change regarding the precise timing of the flight. There was much public outcry and comment in the press. Finally, after several days of vacillating by the committee of officials, Santos-Dumont was awarded the prize as well as the prize money of 125,000 francs. In a charitable gesture, he donated 75,000 francs of the prize money to the poor of Paris. The balance was given to his workmen as a bonus. An additional matching 125,000 francs was voted to him along with a gold medal by the government of his native Brazil. Santos-Dumont's aviation feats made him a celebrity in Europe and throughout the world. He won several more prizes and became a friend to millionaires, aviation pioneers, and royalty. In 1903 Aida D'Acosta Breckinridge piloted Santos-Dumont's airship. In 1904, he went to the United States and was invited to the White House to meet U.S. President Theodore Roosevelt. In 1904, Santos-Dumont shipped his new airship No. 7 (also called Racer), to St. Louis from Paris in several crates to fly at the Louisiana Purchase Exposition. It was a new airship, built to compete for the Grand Prize of $100,000, which was to be given to a flying machine (of any sort) that could make three round-trip flights over a 15-mile “L”-shaped course at an overall average speed of 20 miles/hour (later reduced to 15 miles/hour). It was also necessary for the machine to land without damage (to craft or crew) not more than fifty yards from the starting point. Because he was probably the best-known aviator at the time, the Fair committee went to great lengths to ensure his participation, including modifying the rules. However, upon arrival in St. Louis, Santos-Dumont found his airship’s gas bag to be irreparably damaged; sabotage, although suspected, was never proven, and Santos-Dumont did not participate in the contest. In fact, suspicion of the deed, a repeat of a similar incident in Boston, began to focus somewhat absurdly on Santos- Dumont himself, and he indignantly left the Fair and returned immediately to France. The public eagerly followed his daring exploits. Parisians affectionately dubbed him le petit Santos. The fashionable folk of the day mimicked various aspects of his style of dress from his high collared shirts to singed Panama hat. He was, and remains to this day, a prominent folk hero in his native Brazil. Picture - The November 12 flight. Although Santos-Dumont continued to work on dirigibles, his primary interest soon turned to heavier-than-air aircraft. By 1905 he had finished his first airplane design, and also a helicopter. He finally achieved his dream of flying an aircraft on October 23, 1906 by piloting the 14-bis before a large crowd of witnesses for a distance of 60 metres (197 ft) at a height of two to three metres (10 ft). This well-documented event was the first flight verified by the A�ro-Club de France of a powered heavier-than-air machine in Europe and won the Deutsch-Archdeacon Price for the first officially observed flight further than 25 meters. On November 12, 1906, Santos-Dumont set the first world record recognized by the Federation Aeronautique Internationale by flying 220 metres in 21.5 seconds. Santos-Dumont made other contributions to the field of aircraft design. He added movable surfaces, the precursor to ailerons, between the wings in an effort to gain more lateral stability than was offered by the 14-bis wing dihedral. He also pushed for and exploited substantial improvements in engine power-to-weight ratio, and other refinements in aircraft construction techniques. Santos-Dumont's final design was the Demoiselle monoplane (Nos. 19 to 22). This aircraft was employed as Dumont's personal transportation and he willingly let others make use of his design. The fuselage consisted of a specially reinforced bamboo boom, and the pilot sat on a tensionally-held seat between the main wheels of a tricycle landing gear. The Demoiselle was controlled in flight partly by a tail unit that functioned both as elevator and rudder, and by wing warping (No. 20). In 1908 Santos-Dumont started working with Adolphe Cl�ment's Clement-Bayard company to build the Demoiselle No 19. They planned a production run of 100 units, built 50 and sold only 15 for 7,500 francs for each airframe. It was the world's first series production aircraft. By 1909 it was offered with a choice of 3 engines, Clement 20 hp; Wright 4-cyl 30 hp (Clement-Bayard had the license to manufacture Wright engines); and Clement-Bayard 40 hp designed by Pierre Clerget. The Demoiselle achieved 120 km/h. The Demoiselle airplane could be constructed in only 15 days. Possessing outstanding performance, easily covering 200 m of ground during the initial flights and flying at speeds of more than 100 km/h, the Demoiselle was the last aircraft built by Santos-Dumont. The June 1910 edition of the Popular Mechanics magazine published drawings of the Demoiselle and affirmed that "This machine is better than any other which has ever been built, for those who wish to reach results with the least possible expense and with a minimum of experimenting." American companies sold drawings and parts of Demoiselle for several years thereafter. Santos-Dumont was so enthusiastic about aviation that he released the drawings of Demoiselle for free, thinking that aviation would be the mainstream of a new prosperous era for mankind. Confusion occasionally still arises over whether the Wright 1903 Flyer I, or the 14-Bis was the first true airplane. While the Wrights later used a launch catapult for their 1904 and 1905 machines, Santos-Dumont and other Europeans used wheels whereas the Wrights stuck with skids for too long, which necessitated the use of a catapult in the absence of significant wind. The F�d�ration A�ronautique Internationale, founded in France at the beginning of the century to keep track of aviation records and other aeronautical activities, stated among its rules that an aircraft should be able to take off under its own power in order to qualify for a record. Many Santos-Dumont fans believe this meant the 14-bis was, technically, the first fixed-wing aircraft. We had already seen by the picture in the New York Herald that the plane rests on three wheels and we deduce from this that Mr. Santos Dumont, in order to effect his take-off, has first to make a run over a long level field. With the aid of the starting-off pillar that we use, Orville and I speedily go right up into the air in a much more practical fashion... We are sure to find a lot in our favor if we come to exhibit in France; but the voyage and the transportation of the machine and the pillar cost much more money than the two poor mechanics can afford to spend; also, dear Captain Ferber, if French experts, under your management, desire to come to Dayton, we will give them a demonstration of the machine in a neighboring field, flying for five minutes in a complete circle and let them have an option of the performance and release of the machine, for $50,000, cash down. -W.W. Opinions may vary on whether the Wright Flyer or the 14-bis was the more practical (and thus the "first") heavier-than-air flying machine. 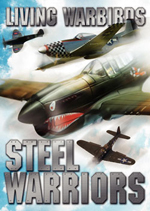 Both designs produced aircraft that made free, manned, powered flights. Which one was "first" or "more practical" is a matter of how those words are defined. 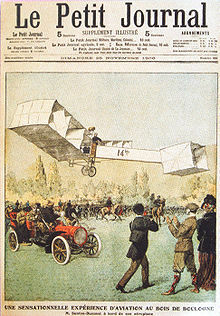 No one could contest that the Wrights flew first or that Santos-Dumont took off on wheels before the Wrights and earned a variety of prizes and official records in France. Patriotic pride heavily influences opinions of the relative importance and practicality of each aircraft, thus causing debate. Americans prefer definitions that make the Wrights the "first" to fly, while Brazilians believe that Santos-Dumont had the first "real", practical aircraft, and that his nationality may have caused his accomplishments to not receive worldwide recognition. 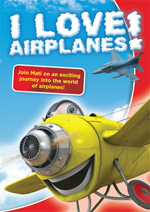 Many other inventors could also claim the title to the first flying machine. From powered, heavier-than-air, but less-than-controllable aircraft, to gliders and balloons, a long series of "flying machines" separately achieved many of the individual criteria that are required of an "aircraft". These achievements, most of them first accomplished in the 1800s, include being able to sustain flight (albeit lighter-than-air flight), using thrust to move wings through the air so as to generate enough lift to rise off the ground (albeit not controllably), and creating a winged vehicle that can stay in the air for more than a few seconds and that can be controlled to turn, dive, climb, etc. (albeit only gliders that required a loss of altitude to "power" them). For example, Frederick Marriott's Avitor was a slightly-heavier-than-air dirigible that was fully controllable. It relied primarily on a large hydrogen gas bag for flight, but it had wings and could only get off the ground by moving forward so that the wings generated the additional lift needed to overcome its weight. Could such a hybrid be "the first heavier-than-air flying machine"? It is only one of many examples of a long history of flying contraptions, so this debate could easily be extended well beyond being about simply the 14-Bis versus the Wright Flyer. In 1904, while celebrating his winning of the Deutsch Prize at Maxim's Restaurant in Paris, Santos-Dumont complained to his friend Louis Cartier about the difficulty of checking his pocket watch to time his performance during flight. 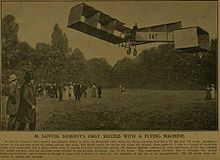 Santos-Dumont then asked Cartier to come up with an alternative that would allow him to keep both hands on the controls. Cartier went to work on the problem and the result was a watch with a leather band and a small buckle, to be worn on the wrist. Santos-Dumont never took off again without his personal Cartier wristwatch, and he used it to check his personal record for a 220 m (730 ft) flight, achieved in 21 seconds, on November 12, 1906. The Santos-Dumont watch was officially displayed on October 20, 1979 at the Paris Air Museum next to the 1908 Demoiselle, the last aircraft that he built. Santos-Dumont bought one of the very early Le Zx�bre cars, now on display at the Sx�o Paulo car museum. Santos-Dumont continued to build and fly airplanes. His final flight as a pilot was made in Demoiselle on January 4, 1910. The flight ended in an accident, but the cause was never completely clear. There were few observers and no reporters on the scene. However, in a PBS documentary about Santos-Dumont it is alleged that the crash was due to a snapped wire. Santos-Dumont fell seriously ill a few months later. He experienced double vision and vertigo that made it impossible for him to drive, much less fly. He was diagnosed with multiple sclerosis. He abruptly dismissed his staff and closed his workshop. His illness soon led to a deepening depression. In 1911, Santos-Dumont moved from Paris to the French seaside village of B�nerville (now Benerville-sur-Mer) where he took up astronomy as a hobby. Some of the local folk, who knew little of his great fame and exploits in Paris just a few years earlier, mistook his German-made telescope and unusual accent as signs that he was a German spy who was tracking French naval activity. These suspicions eventually led to Santos-Dumont having his rooms searched by the French military police. Upset by the charge, as well as depressed from his illness, he burned all of his papers, plans, and notes. Thus, there is little direct information available about his designs today. In 1918 (some sources report 1916), he left France to go back to his country of birth, never to return to Europe. His return to Brazil was marred by tragedy. A dozen members of the Brazilian scientific community boarded a seaplane with the intention of paying a flying welcome to the returning aviator on the luxury liner Cap Arcona. Instead, the seaplane crashed with the loss of all on board. The loss deepened Santos-Dumont's growing despondency. In Brazil, Santos-Dumont bought a small lot on the side of a hill in the city of Petrx�polis, in the mountains near Rio de Janeiro, and in 1918 built a small house there filled with imaginative mechanical gadgetry including an alcohol-fueled heated shower of his own design. The hill was purposefully chosen because of its great steepness as a proof that ingenuity could make it possible to build a comfortable house in that unlikely site. After building it, he used to spend his summers there to escape the heat in Rio, and affectionately called it A Encantada (The Enchanted), after its street, Rua do Encanto (Enchantment Street). The house has its stairs designed in a curious way, each tread alternately hollowed in the right and left, like an alternating tread stair: it allows that the stairs be steep enough to fit the little room available in the house, but still enable people to climb it comfortably. As the first hollow was in the left side of the stairs, people must step first with their right foot to climb it. Santos-Dumont, a lifelong bachelor, did seem to have a particular affection for a married Cuban-American woman named Ax�da de Acosta. She is the only person, other than himself, that he ever permitted to fly one of his airships. By allowing her to fly his No. 9 airship she most likely became the first woman to pilot a powered aircraft. Until the end of his life he kept a picture of her on his desk alongside a vase of fresh flowers. Nonetheless, there is no indication that Santos-Dumont and Acosta stayed in touch after her flight. Upon Santos-Dumont's death Acosta was reported as saying that she hardly knew the man. 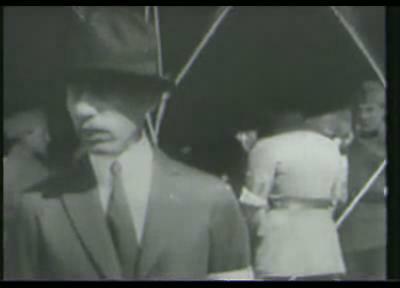 Alberto Santos-Dumont - seriously ill, and said to be depressed over his multiple sclerosis and the use of aircraft in warfare - is believed to have committed suicide by hanging himself in the city of Guarujx� in Sx�o Paulo, on July 23, 1932. He was buried in the Cemit�rio Sx�o Jox�o Batista in Rio de Janeiro. There are many monuments commemorating him in the country of his birth and elsewhere. 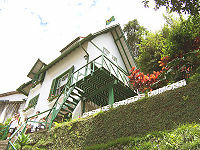 His house in Petrx�polis, Brazil is now a museum. 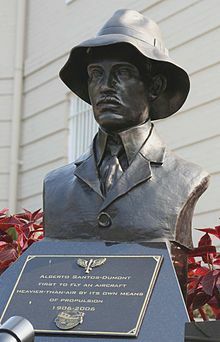 The aviator gives his name to the city of Santos Dumont, in the state of Minas Gerais, Brazil. In this municipality is located the Cabangu farm, where he was born. The Faculdades Santos Dumont is a group of private higher learning colleges in the city. The city of Dumont, in the state of Sx�o Paulo, near Ribeirx�o Preto is so named because it is located where it used to be one the largest coffee farms in the world, between 1870 and 1890. The farm was owned by Alberto Santos-Dumont's father. It was sold in 1896 to a British company, the Dumont Coffee Company. The Rodovia Santos Dumont is a highway in the state of Sx�o Paulo. 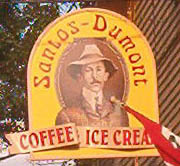 Picture - Ice cream made by the Santos Dumont Coffee Company. The Brazilian Air Force (Command of Aeronautics) awards the Santos Dumont Medal of Merit to important personalities in the world of aviation. The state government of Minas Gerais has a similar medal. The R�seau Santos Dumont is a cooperative university network between France and Brazil, instituted by the French and Brazilian Ministries of Education in 1994, with 26 universities in each country. The American Office of Naval Research of San Diego, California named one of its research airships as the 600B Santos Dumont. The Historic and Cultural Institute of Aeronautics of Brazil has instituted the Santos Dumont Annual Prize of Journalism to the best reports in the media about aeronautics. Tens of thousands of streets, avenues, plazas, schools, monuments, etc., are dedicated to the national hero in Brazil. He is mentioned as a pioneer of aviation, specifically in the area of dirigibles, in the 1984 novel by Robert A. Heinlein entitled Job: A Comedy of Justice. The official Brazilian Presidential Aircraft, an Airbus Corporate Jet tail number FAB2101, was named Alberto Santos Dumont. A popular Chilean rock band of the 1990s adopted the name Santos Dumont. A short story by H.G. Wells, "The Truth About Pyecraft", includes a reference to Santos Dumont and his skill as an aviator. The aviator gives his name to a boutique Aircraft Management and Consultancy Company, Santos Dumont, founded in May 2004. Picture - Alberto Santos-Dumont footage starts at 21 seconds in this 1945 newsreel on various firsts in human flight, but be aware of factual errors in the narration (full size). de Mattos, Bento S. "Santos Dumont and the Dawn of Aviation." AIAA paper # 2004-106, 42nd AIAA Aerospace Sciences Meeting and Exhibit, Reno, Nevada, January 2004.
de Mattos, Bento S. "Short History of Brazilian Aeronautics." AIAA paper # 2006-328, 44th AIAA Aerospace Sciences Meeting and Exhibit, Reno, Nevada, January 2006. Garrett, Charles Hall. "A Builder of Successful Air-Ships". The World's Work: A History of Our Time, VIII, May 1904: pp. 4737-4739. 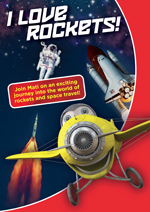 Hansen, James R. First Man: The Life of Neil Armstrong. New York: Simon & Schuster, 2005. ISBN 978-0-7432-5631-5. Hoffman, Paul. Wings of Madness: Alberto Santos Dumont and the Invention of Flight. New York: Hyperion Press, 2003. ISBN 978-0-7868-6659-5. Santos Dumont, Alberto. My Airships. New York: Dover Publications, Inc., 1973 ISBN 978-0-486-22122-9. Waugaman, Elisabeth P., ed. Dx� Asas aos Seus Sonhos / Follow Your Dreams: The Story of Alberto Santos Dumont), (bilingual, Portuguese/English). Rio de Janeiro: Prometheus Press, 2005. 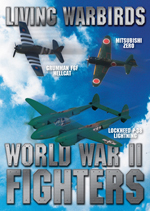 ISBN 978-85-99240-02-1. Winters, Nancy. Man Flies: The Story of Alberto Santos-Dumont, Master of the Balloon. New York: Ecco Press, 1997. ISBN 978-0-88001-636-0. Wykeham, Peter. Santos Dumont: A Study in Obsession. New York: Harcourt, Brace & World, 1962. ISBN 978-0-405-12210-1.